James Keli'ipio Kahea Mawae of Molokai - Keli'i learned slack key at 8 years old from his tutu (grandmother), Lucy Kapika Mahina Panaewa. 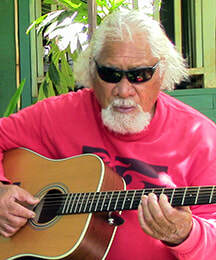 He is honorary Mayor of Molokai and caretaker of land sea people of Molokai and the spirit of the Hawaiian people. Warren Liu (Maui), Doug & Sandy McMaster (Kauai); Jerry Thompson (Wisconsin); Lindsay Maclean (Kauai); and possibly more. Directions: In Hanalei, a block past the shopping center, turn towards the mountains at Malolo Rd. A small Hanalei Community Center sign & concert banner is on the edge of Waioli Park soccer fields. Go 20 yeards, turn left into the gravel parking area. Directions: The All Saints’ Church is easy to find at 4-1065 Kuhio Hwy. in Kapaa, Kauai. It is 1/2 mile south of downtown Kapaa on the mountain side of the road next to the Sudz Car wash between the Shell and Texaco gas stations.